Blomqvist was fastest, but no pole. © FIA. Tom Blomqvist stormed to the top of the FIA European F3 ‘Qualifying 2’ timesheets this evening; however a penalty for changing his Volkwagen engine has earned the Jagonya Ayam with Carlin driver three ten-place grid penalties. The penalty gives Max Verstappen pole position for both of tomorrow’s races. Blomqvist will also carry a ten-place grid penalty for race one in the third round at Pau. Blomqvist made certain of the initial result by twice being the only driver to break the 1’32” marker. Indeed come the end of session, Blomqvist’s best of 1:31.655 was almost four-tenths quicker than the nearest quick man Verstappen. 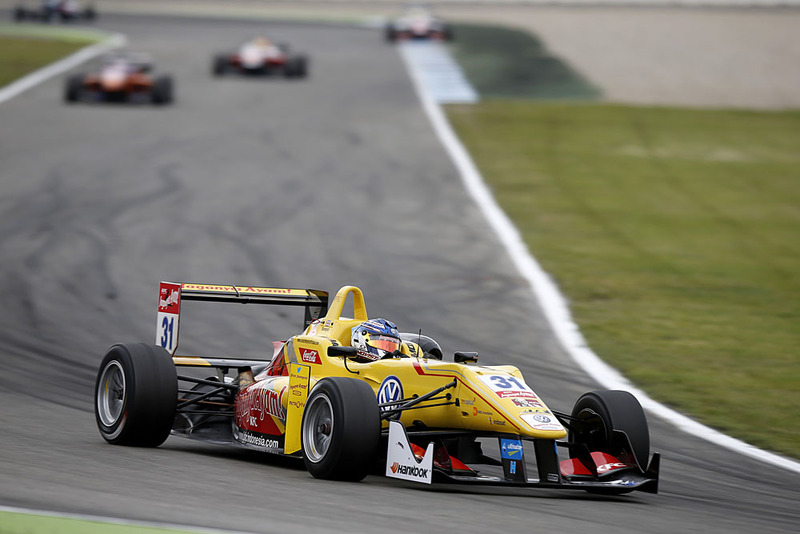 While Esteban Ocon, Antonio Giovinazzi, Antonio Fuoco and Felix Serralles seemed content to head the time sheets through the opening 15 minutes of 20, Blomqvist made his presence felt when he jumped to the top of the standings with a 1:31.958s. Verstappen followed that up with a 1:32.014s, while Ocon maintained the pressure by lapping some three-hundredths slower than his Dutch rival; however no-one had any answer for Blomqvist’s next run, which put the Volkswagen-powered driver beyond the reach. With slightly older engines, Verstappen and Ocon could do no better, while Giovinazzi rose to 4th with three minutes remaining, when he clocked up a 1:32.105. Ed Jones registered a lap six-hundredths for 5th and Antonio Fuoco had a better go at qualifying today, when he assumed 6th spot ahead of Felix Rosenqvist and race one winner Lucas Auer. Felix Serralles and Nicholas Latifi rounded out the top ten. Disappointingly, Jordan King could only manage a best of 19th, having finished on the podium earlier in the day. Tom Blomqvist and Tatiana Calderon; 10-place grid drop (using different engine, following previous round). Michele Beretta; 5-place grid drop, (causing collision in race one).